If you have the button on your form selected, you will see its properties in the properties window as shown below. You can scroll up and down the properties by using the scroll bar and you can sort the properties either into alphabetical order, or by category, by clicking on the tabs above the window. The Name of the button is a very important property as this is how other functions or controls refer to it. 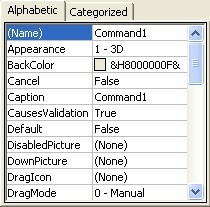 A control's name must not contain any spaces. Another important property is the Caption. This determines what text the user sees on the button when the form is running. This does not have to be related in any way to the button's Name. The form itself has properties which can be viewed simply by clicking somewhere on the empty form. The same properties of Name and Caption exist for the form. Try changing the caption of the form. You will find the text in the blue header of the form change accordingly.